Our Education Department invites you to join us for adult classes for in acting, voice, and dance and more! Classes are held at the SLT Education Facility located at 237 S. Florence, just 1-1/2 miles from the Landers Theatre. MUST have some stage or screen experience. This is NOT a beginning class, but all other levels of current or previous experience are welcome. Stage OR screen experience welcome! 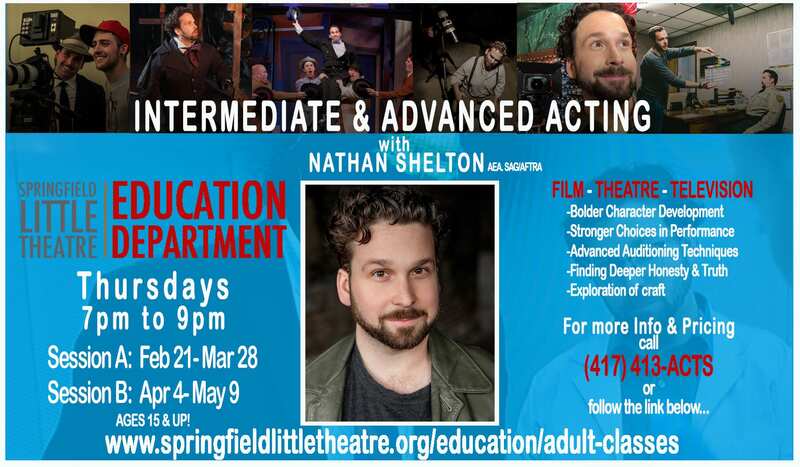 This studio-style 6-week class, led by professional stage & screen actor Nathan Shelton, will focus on exploring more truth and honesty in performance, greater depths of character development, making bolder choices, exploration of type and how it can be manipulated, and auditioning techniques. 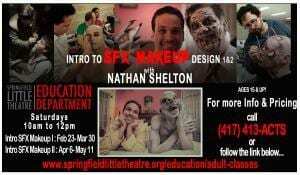 This is a monologue-based class, utilizing peer feedback and one-on-one guidance by the instructor. The classes will build upon the principals learned in previous classes as well as utilized vital feedback from peers, so attendance of every class session is strongly encouraged. A performance video will be recorded by the end of the six-week session to provide reel material for every student. To find out more about Nathan Shelton’s work visit www.nathanshelton.com. This 6-week class will focus on the fundamentals of Special Effects Makeup design and application. Each class session will have a new topic and feature a demonstration as well as one on one guidance by the instructor in applying the makeup and effects to the students and their classmates. There will also be outside class video tutorials from time to time that students may utilize to practice at home, which can save time for more hands-on application during the two-hour class sessions. The classes will build upon the principals learned in previous classes so attendance of every class is strongly encouraged. The second session of these classes will continue to build upon the lessons learned in the first session for more advanced students who wish to continue learning and growing. To find out more about Nathan Shelton’s work visit www.nathanshelton.com. For a printable adult class schedule with descriptions, please click here.